The Lauf, or "Leaves", suspension fork comes to us from the country of Iceland. This Grit version is designed to replace and your gravel or CX frames rigid fork. With no "moving" parts, the Lauf Grit Suspension fork is a ZERO maintenance, highly efficient 30mm travel suspension fork. It makes an excellent option for those who enjoy the simplicity of a rigid fork but would like some additional comfort, traction and capabilities out of their current set up. Drop the bone-shaking beat-down portion of your ride. How does it work? It uses a leaf spring system much like you may have in your automobile. Basically, there are six small leaf springs made of high-performance S2 glass fibers on each side of the fork which, when under load, flex and absorb bumps. The 30mm of travel is progressive, meaning it will be sensitive in the beginning of its travel and stiff towards the end. Maximum Tire Width 700c x 42 or 27.5 x 2.1"
* For maintained steering characteristics from a 45/395mm rake/A2C rigid fork. 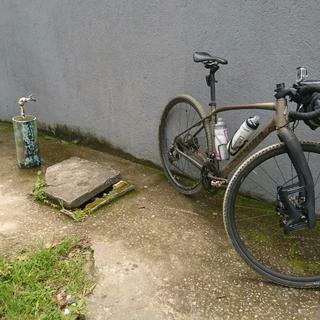 After bouncing on gravel and poor roads for years, I decided to try the Lauf Grit from on my CX/Gravel bike. This fork complete eliminates road buzz and takes the edge of bad road. With this fork I'm much more relaxed and in control on rough (rocky/rooty) and steep descents. There is a little sway when sprinting or climbing out of the saddle, but much less disturbing than a typical front suspension. This fork is worth the extra cost and weight for gravel riders. It does an amazing job of absorbing the vibrations from rough gravel without being so soft that it feels like you are bouncing off the road. Helps with fatigue on the long, endurance rides. Folks in my niche of the cycling world like cushy road tires and retro steel bikes that flex. Some go out of their way to find the flexiest bike they can. The Lauf Grit fork makes my bike feel like a normal road bike on the road (as long as I'm not a spaz). As soon as you hit the trails, it's like your road tires got 40mm wider. It just scrubs the edges off of every hit. I thought I would only run it for particular events, but I feel no need to remove it. This is an amazing fork! I use it for my gravel bike (specialized diverge) and it made a great bike turn awesome. is it compatible with 29'' wheel? BEST ANSWER: 700c and 29" are the same rim diameter (622mm is the diameter). When they say you can run 700c x 42, that means you can run your 29" wheelset with a narrow tire. Something like 29" x 1.6" would work. You can't run a full sized 29" mountain bike tire, like a 2.1" or a 2.3" mountain bike tire. You can fit a 29 in there, I use it with a 700c that has the same diameter. The thing you have to check is hub spacing and tire width clearance, this depends on your setup.